Memorial Day weekend...aka the first weekend of summer. Typically, here in Wisconsin, Memorial Day weekend is cold and wet. As a kid, we went camping each year and it ALWAYS rained! This year was atypical with lots of sunshine and temps in the 70's & 80's. Would've been great camping. What is it they say? "All good things must come to an end." That's right, cold front hit! The temps dropped from 84 to 44 within 20 minutes!!! Tonight they've even posted frost warnings. I REALLY hope we didn't use up all of our summer in one weekend! 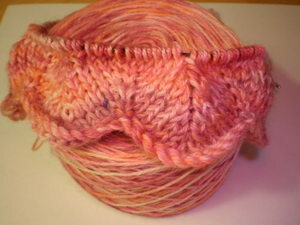 With the cooler temps, it seems appropriate to cast on another cowl. 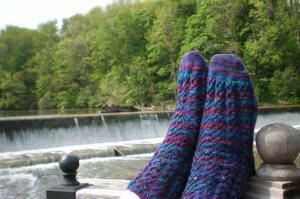 This time the pattern calls for sock yarn. 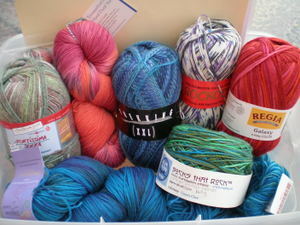 Funny, I seem to have a few skeins of sock yarn laying around. Renaissance Palm Cowl by The Plucky Knitter made with Lime & Violet Dream Date. 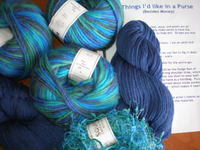 The temps have cooled but at least the yarn is reminiscent of warm summer days! Hopefully, summer will return again someday to my neighborhood. It was nice while it lasted! They say that llamas have a calming effect...they can also bring a sock warrior back to life. That's right, we headed to Bahr Creek Llamas for the annual shearing days. Special K was much braver this year than last and got right into the pen to feed the llamas. A good time was had by all. 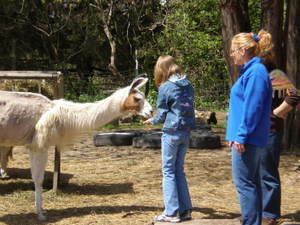 Of course, this year there was another reason for our visit to the llama farm. My friend has asked me to knit a felted purse for her. So, we took her shopping for materials. Now, I was going to be perfectly content to let my friend do the spending, but it didn't quite work out as planned. 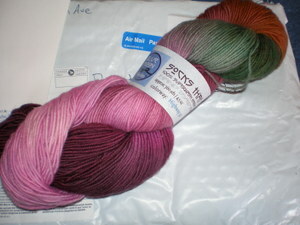 Recently, I'd read about Flat Feet and vowed that if I ever saw it, that a "skein" would be mine. Guess what they had at the llama farm!?! This stuff is wild! (There are a number of examples of it knit up on Ravelry.) 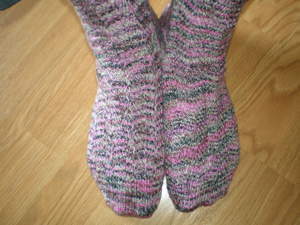 The socks get knit straight from the flat; unravelling as needed. Cool. At home, it is once again safe to go to the mailbox. 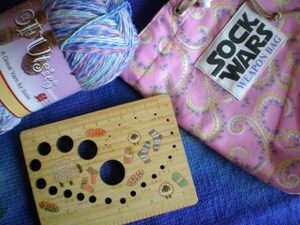 The sock bag arrived from Star Knits. (Thanks!) I may be dead, but winning the StarKnits' contest and a ball of my own Tofutsies from Fairy Godmother makes my "death" tolerable. But, I'm also a sucker for needle gauges. But, never had I seen one as cool as the one I found in Karatstix' Etsy shop! All in all, it was a great Saturday! Totally rejuvenating! The best part though is that there are still TWO more days left for this weekend!!! Well, it finally happened. 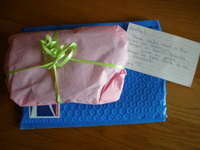 All wrapped up in this quiet, unassuming blue envelope and pink tissue were my death shroud socks. The color is different than any I've seen. The toes are a bit tight, but that's not my assassin's fault; the master size list did not have a size 11 option. I've written and asked for some leftover yarn to redo the toes. They'll be fine. The SIPs (socks in process) also arrived. I knew my previous target was using the same yarn that I'd used for my initial victim. I resisted the temptation to cast on while waiting...that would've been cheating. So, my assassin will receive the unfinished sock and the gifts that have been assembled to go to their intended victim. My death came quietly and without fanfare. The battle continues with nearly half the warriors killed and many more fatigued from the numerous troubles along the way. Here's hoping for a happy "afterlife". Between Sock Wars and other visitors (and a little thing called "work"), there hasn't been much time for web surfing. Ta-da! That's when 3rd Daughter comes along to save the day!! Two fiber related weblinks of an anglophile nature. Secondly, the BBC has created quite a dust up in the knitting world over a pattern. Razzamatazz created a loveable plushy based on a character from Dr. Who. Now, her world's been turned upside down by the BBC. Read about it here. You can also keep up with the latest details over at Ravelry. Thanks for the assist 3rd Daughter! A parcel arrives in the mail. You pause and assume it means "Sock Wars Death". Then you remember, you worked out a Ravelry deal for yarn. Draya was destashing. Lucky me. However, for a few moments it seemed appropriate to gather my family and say "goodbye" before upwrapping socks that spell my demise. These may be socks...in the future...for today, I'm alive!! My second Target, Technoknitter, has met her untimely death. 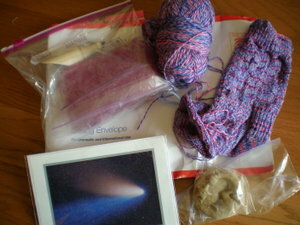 It seems the postal service was just as speedy at delivering, as the knitting had been. 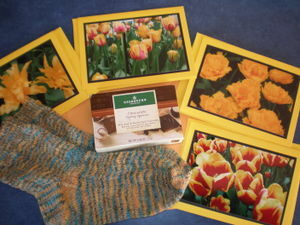 Late Saturday she received her parcel with chocolates from her previous assassin, flowers from me and socks that were knit jointly by two assassins. This morning, in addition to the email from Technoknitter that she was mailing her weapon, word was sent that my assassin has completed the socks that spell my demise are on their way. Time is short! In the meantime, why not share some sunshine to brighten the days!?! The blocking is finished and the Mystic Light Shawl is ready for wrapping and shipping. 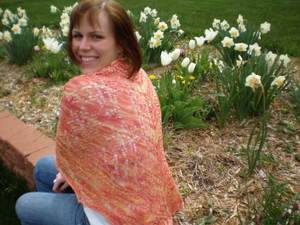 The finished shawl seemed the perfect venue to con 3rd Daughter into modeling. Even with the knowledge that my Sock Wars end is near, it's hard not to smile while surrounded by friends and family! It's been a great weekend! Fairy Godmother and 3rd Daughter are visiting and it's been a weekend full of good times and knitting. 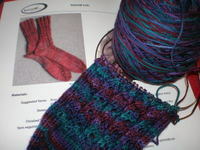 Projects are flying off the needles! No time for blogging at the moment. 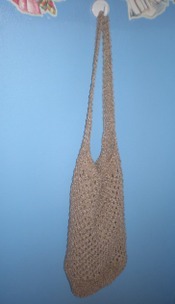 In the meantime, another Rutabaga Market Bag to keep you company. So easy, so quick, and just the right thing to be working on while conversations are flying around the room. Look what arrived in the mail on Wednesday: my newest weapon and a treat my victim had picked out for her target as well as information about her progress. 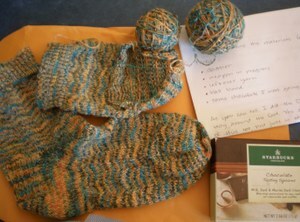 At first, I was super excited at the thought of receiving a mostly completed pair of socks. 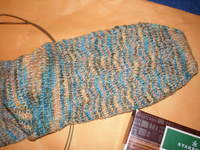 However, there was one problem; the finished sock had patterning on the sole of the sock instead of stockinette. Surprisingly, a number of people on the Sock Wars board suggested leaving the sock that way...they thought it was neat. But, knowing that my next victim had ripped out her socks twice because of gauge modifications she'd made to the pattern (a no-no according to the rules) AND knowing that I'd be disappointed with socks with patterning on the soles, it didn't seem right to leave them that way. A quick note to my newest victim confirmed my thoughts. If nothing else, I'm a merciful killer. Besides, I strongly believe that what goes around, comes around!!! So, once the unfinished sock was knit, the patterned sole paid a visit to the frog pond. I carefully inserted my needle to the place where the re-knitting needed to begin, cut open the toe and attached the ball winder to the yarn end. Two minutes later, with the foot unravelled, a revelation: EACH stitch had "landed" properly placed on the needles without need for a single adjustment. I knew then that Karma agreed with my decision to reknit! Never before has ripping back gone so smoothly. And that my friends is why there was no Web Wednesday post on May 14th. The only thing I missed mentioning that is time-sensitive: sign-ups for Secret Pal 12 begin today, May 15th. This time around the hostesses have a limit of 300 participants and a participation fee. Our "doggie bags" from dinner the other night were packed in "evidence boxes"!!! 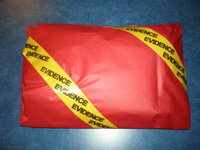 It seemed appropriate to also use evidence tape to seal up the parcel for LiliBean. 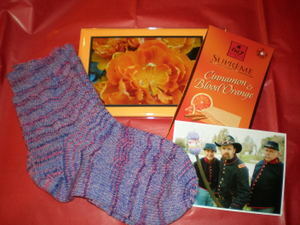 In addition to the socks, it seemed fitting to include flowers (notecards) in her favorite color (orange) and a bar of chocolate (Cinnamon & Blood Orange). I also made a notecard with the photo from Friday. LiliBean is an honorable warrior. Her target now becomes my target. She had finished one sock and had gotten to the end of the heel of the second sock prior to today's death. She managed to get to the post office yet today (in her wounded state) to mail the unfinished pair to me. What better epitaph than "honor" is there!? !